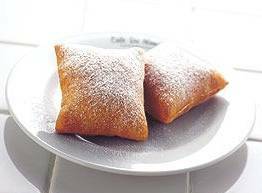 A traditional New Orleans yeast pastry that is deep-fried and served hot with a generous dusting of confectioners' sugar. The name comes from the French word for "fritter." Savory beignets, such as herb or crab, are also very popular. Source: The Food Lover's Companion by Sharon Tyler Herbst. Cafe du Monde, located in the French Quarter of New Orleans is the most famous cafe in town. Everybody goes to this Jackson Square institution for Beignets and Cafe au lait. These beignets are delicious served with confectioners' sugar, fresh blueberry sauce, or any good-quality purchased fruit sauce and even eaten on their own. Puree all ingredients in food processor until smooth. Strain through fine sieve into heavy medium saucepan. Season sauce to taste with more sugar, if necessary. Simmer sauce over medium-low heat until syrupy, about 20 minutes. Sauce can be made 2 days ahead. Cover and refrigerate. Combine milk and yeast in large bowl; let stand until yeast dissolves, about 5 minutes. Whisk in eggs and melted butter. Add 3 cups flour and stir to form moist sticky dough. Heat shortening in deep-fryer to 325 degrees F (160 C). Transfer dough to floured work surface. Punch dough down; cover with kitchen towel and let stand for about 15 minutes. Sprinkle dough with flour. Using rolling pin, roll out dough into 12-inch square. Using pizza cutter, trim edges slightly to form perfect square. Cut dough crosswise into 4 equal strips. Cut each strip into 6 pieces, forming 24 rectangles total. Arrange 3 beignets on each of 8 plates. Ladle blueberry sauce (optional) over and around beignets. Generously sprinkle confectioners' sugar over beignets. Alternatively, place beignets on platter. Generously sprinkle with confectioners' sugar, and serve blueberry sauce (optional) alongside. I like it and so does my family. Great recipe! What temperature would you suggest if using a frying pan on an electric stove? I did medium high, and they cooked too fast. Though blackish, they were still tasty! Went down well with all the family, even Grandma enjoyed them and she gets terrible indigestion from anything. Sweet and delicious, mmmm! Keep those wonderful recipes coming Diana. I love beignets! I made them with my friends and it was soo much fun! Everyone needs to try to make beignets. The ingredients for beignets asks for 1/4 sugar but does not mention when it goes into the dough. I tried to make it both ways, with sugar and without, but the final result was about the same: nothing like the beignets that I ate in New Orleans. This comes out more like doughnuts from Dunkin' Donuts. Thank you for a great recipe, even Swedes enjoy it! These were great! Thanks for the recipe! I almost jumped for joy when the dough rose haha.